If you're not aware, iOS 12 has been introduced to the world through WWDC 2018 with its captivating features for iPhone and iPads. Users can make use of multi-user FaceTime, better responsive device with keyboard typing, fast performance, Screen Time monitoring and Memoji creation etc. But, the major issue that would clog your mind is, iOS upgrade related data loss incidents. In this article, we have introduced how to recover photos from iCloud with the best way. We will also tell you how you can get your photos back if you have iTunes backup or no backup. Stay tuned to know more! When you think of restoring photos from iCloud, Tenorshare UltData comes as a forerunner with features like recovering deleted data from iCloud backup file, iTunes backup file as well as directly from the iOS device itself (means when you've no backup at all). 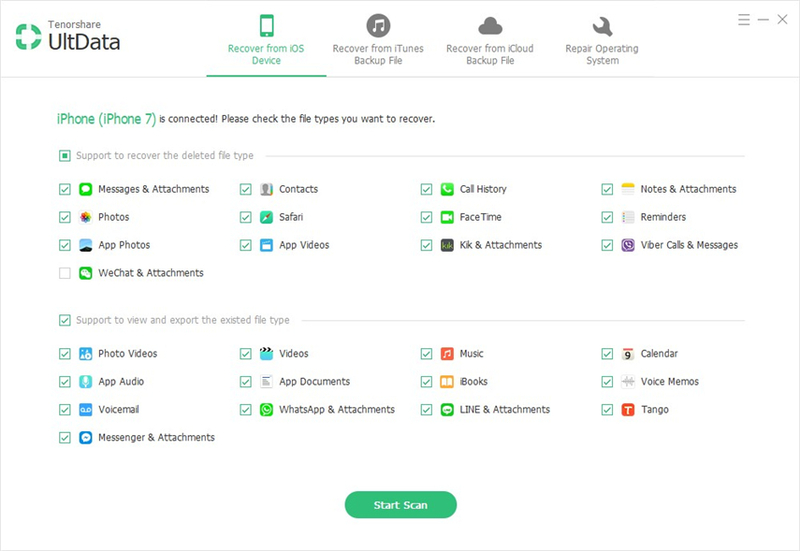 This tool fixes iOS 12 upgrade related data loss, you can effectively recover photos from iCloud using this desktop program. 25 and above types of data are compatible with this application. Step 1: Get the program launched after downloading it on your PC. Select 'Recover from iCloud Backup File' option from the UltData window. Step 2: Now, you will be navigated to the iCloud login page under UltData. Enter the Apple ID and password of your iCloud account and then select the iCloud backup file. Click the 'Next' button afterwards. Step 3: Again tap on the 'Next' button after choosing 'Photos' and 'App Photos' options from the left panel. Give sometime to the backup to get downloaded. Step 4: Preview the data by selecting it from left panel. Tap the 'Recover' button and then select a target location to save the data. Hit the 'Save' button and choose between the 'Recover to Device' or 'Recover to Computer' option thereafter. In this part, we will see how to recover photos from iPhone, without iCloud. Even if you have upgraded to iOS 12 and facing issues, Tenorshare UltData will help you to get the data efficiently. Step 1: Install and launch Tenorshare UltData on your Mac/PC. Get a lightning cable and connect your iPhone to the system and then trust your computer. The 'Recover from iOS Device' tab will be selected by default on the UltData interface. Step 2: While reaching on the next window, you need to select the file type here. Mark the checkbox against 'Photos' and 'App Photos' options and then click on 'Start Scan' afterwards. Step 3: As soon as the software finishes scanning the data, you can choose the items from the left panel to preview them. Hit the 'Recover' button thereafter. You have the option to set the 'Output Settings' as well as the destination folder on your computer for recovering deleted photos from your iPhone. Step 1: Click on 'Recover from iTunes Backup File' right after you launch UltData on your PC. From the available list, select the iTunes backup you want to recover and press the 'Start Scan' button. Step 2: On your screen, you will find the scanned and categorically arranged data. Click on 'Show Only Deleted' from the drop down list once you have marked the 'Photos' and 'App Photos' options from the left side panel. You can preview the photos and select the ones you want to restore. Step 3: Now, press the 'Recover' button to choose the file format and click 'Save'. 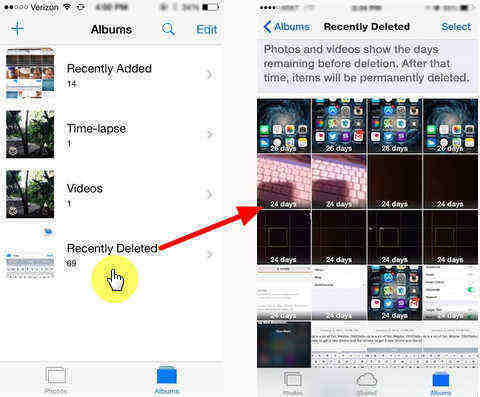 Press the 'Recover to Device' to directly restore the deleted data to your iPhone or click 'Recover to Computer' for saving a copy on your system. The above article helped us conclude that for all iOS issues leading to data loss, you have the only solution for recovering the data is Tenorshare UltData. Each method is fruitful in data restoration, so that you can choose what suits you best. You not only restore photos from iCloud, but also from iTunes backup and the device itself.